Hey! It’s almost February, and you know what that means. It means it’s time for my Four in February! And my articles! And the Prologue, full of questions! What is Four in February? 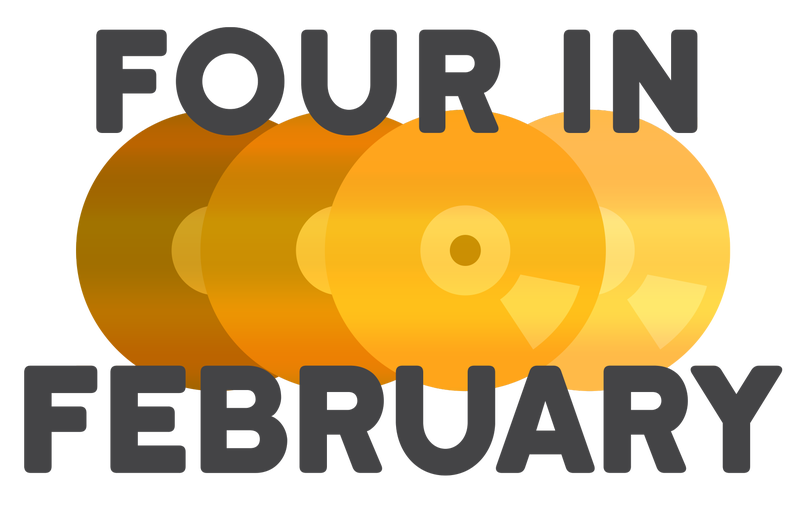 Four in February is an event that an amount of gamers participate in where we beat four games in the month of February. We don’t do it for any reason other than to devote some time to beating 4 games. Joystiq contributor Mike Suszek came up with the idea in 2013, and threw down the gauntlet to anybody who’d be willing to do it. I have a really big backlog of games. Bundles and my very weak will during sales are to blame for this. Because of this massive backlog, I’ve decided to carve out some time to clear four games during the month of February. I also use the time to practice my article writing, as I write reviews/writeups after I finish each game. It’s almost like a book report for school, even though I’m not in school. Okay, what did you do in years previous? One year I’ll figure out a better way of showcasing the games. This is not that year. Well, after last year’s spectacular failure (it was bound to happen), I’m taking a slightly different approach: Two of these are very short games, while the other two are a bit longer, but I’ve had them on my radar for a while, one for much longer than the other. What if you don’t finish this? Then I’ve failed you again, and I should try for something a little more… realistic. I’ve moved out of the place I lived in last year and I have an actual desk to work on these write-ups now, so that should help (I wrote most of my TAY articles from my bed in previous years). The games are on average shorter than the other games I’ve picked in previous years, with the longest of the bunch probably being The Silver Case, based solely on howlongtobeat.com’s expertise. As per previous years, I 100% reserve the right to swap out a title for any reason, but I’m fairly certain that I won’t have too many problems this year around. I might even try streaming these, but no guarantee. If I do, there won’t be a facecam for sure and I may or may not have a mic going. This all depends on: 1) whether or not I want to stream; and 2) if I want to do it through Steam itself or fight and figure out how OBS works. As for asking to help on the stream front, I’ve got friends who do stream, so I’ll probably ask for their expertise with anything. I really do appreciate suggestions, but I might not take it into advisement, so please bear with me. One final thought, and maybe a tease for next year: I was originally planning for this year to be a “Famously Bad Games” year, as I’ve already got a few of them on Steam saved for just an event, but I really wanted to prove to myself that last year was just a fluke and that I can do this for real, like with a proper work ethic and everything. Elihu&apos;s Four in February 2017: It&apos;s Over, Isn&apos;t It?